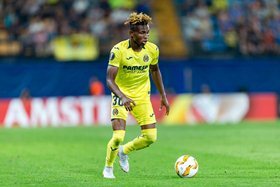 Super Eagles invitee Samuel Chukwueze became the second youngest Nigerian to score in the Spanish La Liga after finding the net for Villarreal in their 2-2 draw with Rayo Vallecano on Sunday evening. The Diamond Academy product broke the deadlock at the Estadio del Rayo Vallecano when his left-footed shot from the center of the box beat goalkeeper Dimitrievski in the 33rd minute, assisted by Ramiro Funes Mori. Chukwueze was aged 19 years, 5 months, 20 days when he netted his maiden goal in the Spanish topflight, and overtook ex-Flying Eagles skipper Ramon Azeez as the second youngest Nigerian goalscorer since the formation of the league. The winger came close to scoring a second for Villarreal five minutes into the second half but his left footed shot from the right side of the box missed the target. He celebrated his first call-up to the Super Eagles by scoring his first goal for Villarreal's first team in a 3-3 draw with Almeria in a Copa del Rey match at the start of this month. Former Granada striker Isaac Success is the youngest Nigerian player to score in La Liga, aged 18 years and 11 months when he netted against Valencia during the 2014-15 season.